A big topic of conversation at this year’s Grassland Restoration Network (GRN) workshop had to do with designing seed mixes to combat potential invasive plant problems. 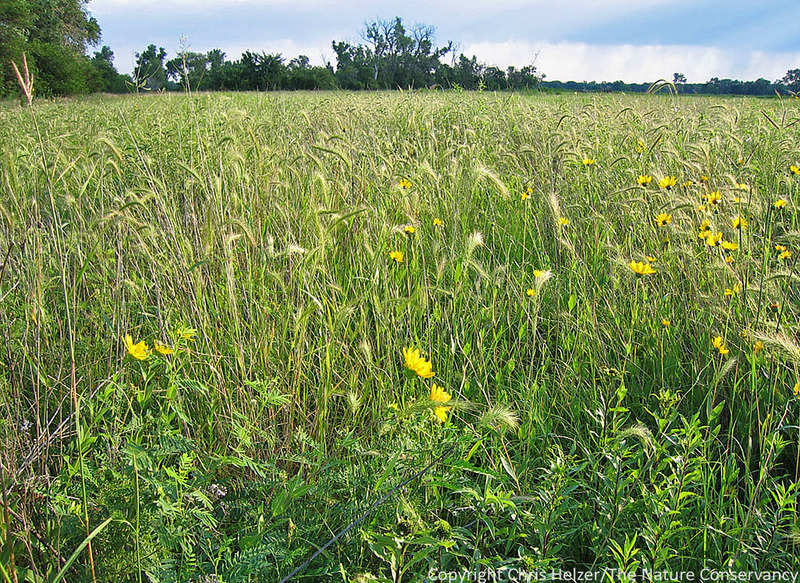 When converting cropland to prairie vegetation, the first few years of establishment are sometimes a race for dominance between prairie plants and invasives. Once a strong native plant community becomes established, it is more difficult (but still possible) for invasive plants to become dominant, so those first few seasons are critically important. Over the years, a number of people have tried using extra high seeding rates of various native plants to see if those natives could help stave off invaders. In an ideal scenario, a high abundance of some showy wildflower would outcompete invasive plants but allow other native plants to establish. Nice, right? Lots of pretty flowers during establishment, no invasive species to worry about, and a nice diverse prairie community in the long run. Black-eyed Susan is a species that has shown some promise as a species that can compete against invasives but still allow the establishment of a diverse plant community around it. The Nature Conservancy’s Platte River Prairies, Nebraska. I first heard about this idea at the 2004 North American Prairie Conference. In one of my favorite presentations of all time, Shawn Schottler of the Science Museum of Minnesota compared various plant species to celebrities. As he described his experiments, he said he was trying to find Chuck Norris plants (tough good guys) that could fight off Mike Tysons (aggressive invasives) while still allowing Patsy Clines (less competitive natives) to establish. As I recall, he was having some luck with Chuck Norris species such as black-eyed Susan (Rudbeckia hirta), wild bergamot (Monarda fistulosa), and others. At this year’s GRN workshop, Jack Norland of North Dakota State University described recent results of some similar experiments on U.S. Fish and Wildlife restoration projects. The “spike” treatments they used consisted of ultra high seeding rates of species such as plains coreopsis (Coreopsis tinctoria), purple prairie clover (Dalea purpurea), Canada wild rye (Elymus canadensis), and others. His data showed Canada thistle to be much less abundant in spike treatments than in the controls. Interestingly, we’ve had some accidental experience with this topic here in our Nebraska Platte River Prairies. During the drought years of the early 2000’s, some of our prairie plantings ended up with lots and lots of Canada wild rye. In some cases, the species was so abundant that our plantings looked like wild rye monocultures. We weren’t the only ones. Prairie Plains Resource Institute had plantings that looked much the same during those years. There was some hand wringing about whether or not the plantings had failed, especially given the drought conditions at the time, but Bill Whitney of Prairie Plains assured us that it wasn’t a big deal. He was right, as usual. The plantings eventually emerged from their wild rye phase and turned into very nice prairies. In fact, our site that had the “worst” wild rye infestation is now the showiest (in terms of big colorful wildflowers) prairie we have. I’m not sure the wild rye helped suppress any invasive species, but a high density of wild rye plants didn’t seem to keep Patsy Clines from eventually thriving. This 2004 photo shows one of our Platte River prairie plantings in its third year of growth. Canada wild rye is visually dominant, but other species are present beneath its canopy. Many of our young plantings from about that time period looked much like this for several years in a row. Spike treatments/Chuck Norris species/etc., are really just variations on the idea of using a cover crop – planting something intended to establish early and then fade away (mostly or completely) as the desired vegetation takes hold. In some places, cover crops are very useful in agricultural systems as a way to prevent soil erosion and loss of fertility, suppress weeds, and/or preserve soil moisture. It seems logical that they would also help with prairie restoration establishment. 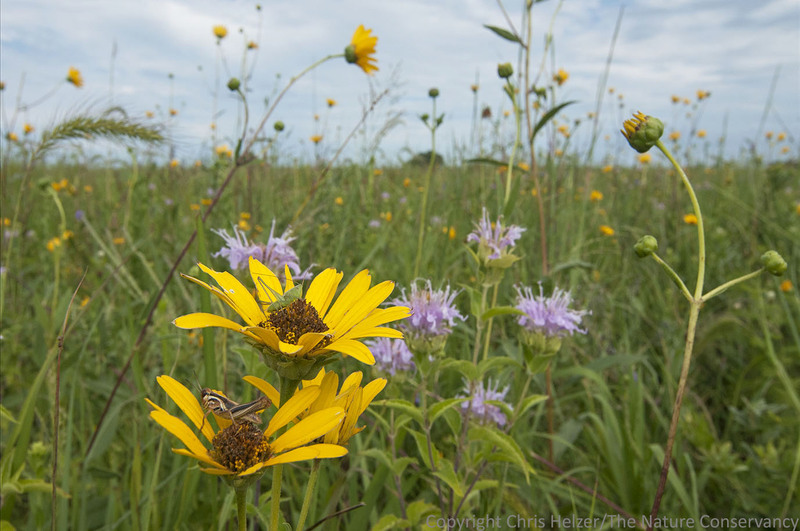 In fact, I recently talked to someone with the Natural Resources Conservation Service (NRCS) in north central Nebraska who says their best successes in restoring sandhill prairie come when they use a cover crop of millet. On the other hand, I remember a GRN workshop about five or six years ago when we had a group discussion about our experiences with various cover crops. Participants from across the Central U.S. seemed to reach consensus that cover crops were as likely to be counterproductive as helpful to prairie restoration efforts. This seems to conflict with the successes seen by people like Shawn Schottler, Jack Norland, and others. Why the differences? Part of the issue is certainly that we’re still experimenting with different species, and still have a lot to learn. Beyond that, though, anyone who has spent many years restoring prairie knows that establishment results can be very difficult to predict, even within the same site. Just when you think you’ve got something figured out, your next planting turns out completely unlike what you’d expected. Those kinds of inconsistencies, combined with differences in site attributes such as soil texture and fertility, rainfall, and latitude make it almost impossible to come up with restoration recommendations that apply everywhere. In fact, if we’ve learned anything through the Grassland Restoration Network, it’s that it’s important to start big projects by doing some small experimental plantings to see what works best in that place before investing in larger scale work. There is great value in getting a bunch of restoration practitioners together in one place. We often bring home new ideas to try. Sometimes they even work. 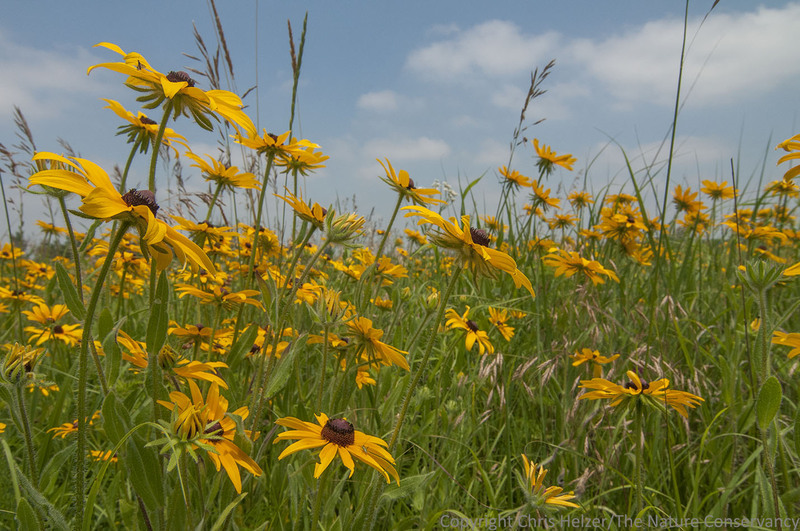 2015 Grassland Restoration Network workshop – Minnesota. Clearly, the idea of “spike” treatments and similar strategies hold a great deal of promise if they fulfill their promise of preventing invasives while facilitating establishment of diverse plant communities. However, since it’s also clear that successful strategies from one site don’t always translate well to others, we may each have to find our own formula for success. Hearing about Dr. Norland’ experiments in the Dakotas has inspired us to do some more experimentation here. Maybe we can find a few Chuck Norris species to keep the peace in our Platte River Prairies. If you’ve had positive or negative experiences with cover crops in prairie restoration, or have found your own Chuck Norris of the prairie, please share what you’ve learned in the comments section below. Thanks. Chuck Norris doesn’t wear a watch. He decides what time it is. There used to be a street named after Chuck Norris, but it was changed because no one crosses Chuck Norris. When Chuck Norris does a push up, he isn’t lifting himself up, he’s pushing the Earth down. A bulletproof vest wears Chuck Norris for protection. It’s always fun to hang out with innovative people, especially when they’re working on the same kinds of challenges I am. I was invited to spend several days last week at a South Dakota prairie restoration (reconstruction) workshop, organized by and for staff of the U.S. Fish and Wildlife Service. Tom Koerner, an old friend from when he worked in central Nebraska, asked me to come up and share what we’ve been doing with prairies, and I was glad for the chance to see what’s happening up north. Tom Koerner (right) of the U.S. 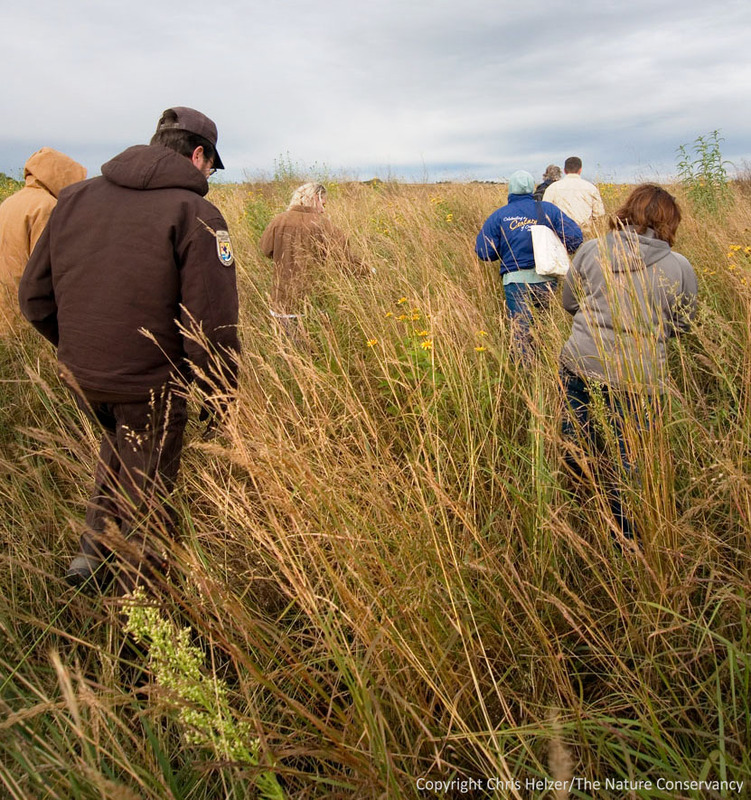 Fish and Wildlife Service talks with colleagues about prairie restoration near Madison, South Dakota. The Fish and Wildlife Service refuges in the Dakotas have a long history of restoring and managing wetlands and surrounding uplands as primarily duck habitat. Recently, a few biologists and managers have begun questioning the relatively narrow focus on ducks, in view of the much broader mission of the agency (“The U.S. Fish and Wildlife Service’s mission is, working with others, to conserve, protect and enhance fish, wildlife, and plants and their habitats for the continuing benefit of the American people.”). Rather than planting non-native grasses and legumes as duck nesting cover, they say, the Service could be adapting high-diversity restoration techniques used in nearby states to better accomplish their broad mission. 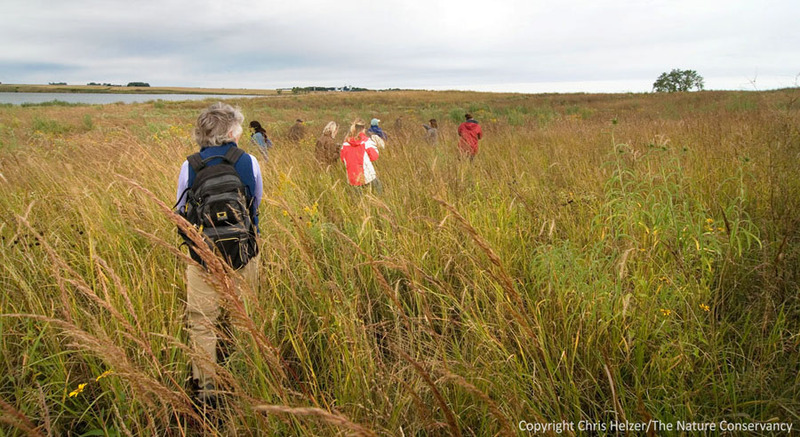 To those of us who have been working with high-diversity prairie/wetland restoration for years, the decision seems like a no-brainer, but there are several significant obstacles standing in the way for the Fish and Wildlife Service. The first obstacle is really inertia. The refuge system in the Dakotas has established a strong reputation as a duck production area among the public, and refuge managers have established techniques and strategies that have been consistently used for many years. It’s difficult to convince someone to change what they’ve been doing over their entire career, especially when you’re asking them to start using a technique they’re unfamiliar with. To those who haven’t used it, high-diversity restoration sounds expensive and risky – and what if it isn’t good for ducks? The second obstacle is invasive species. In much of the Dakotas, and certainly on the sites we visited near Madison, South Dakota, Canada thistle is a pervasive and invasive threat. Taking land out of crop production and planting perennial vegetation often produces large dense crops of Canada thistle (except when it doesn’t – but there isn’t currently a good way to predict that outcome!). Because Canada thistle is both aggressive and a state-listed noxious weed, the Service can’t ignore large populations of the species in restored grassland areas, and has to act to control it. Small patches can be spot-sprayed, but many areas become infested so heavily that they have to be broadcast-sprayed. This makes planting a diversity of plant species a risky endeavor, because there’s a pretty good chance much of that diversity will have to be sacrificed during Canada thistle control efforts. The third obstacle is the cost. The perception is that high-diversity restoration is much more expensive than simply planting several species of exotic grasses and some alfalfa. There is obviously some truth to that. Particularly if you’re buying the seed you use, a diverse mixture of native prairie seed can be very expensive. However, there are several other ways to measure and mitigate costs. For example, if seed is harvested by agency staff and volunteers, a lot of seed can be obtained pretty cheaply. It’s amazing how much seed a few people can harvest in just a little bit of time when they’re organized and efficient about doing it. In addition, the alternative is Dense Nesting Cover (DNC), consisting of exotic grasses and alfalfa, which typically has to be torn up and replanted every 7 years or so when the alfalfa starts to disappear, so over the long term, the costs of that method are higher than it might seem at first. Combining the Canada thistle threat with the perceived cost, however, makes a pretty strong counter argument to those pushing for high-diversity – and that argument was the main subject of the workshop last week. Bryan Shultz (left) walks with others through a two-year-old seeding. To account for Canada thistle and build diverse prairie restorations, Bryan and Kyle are trying a combination of strategies. First, they are harvesting as much seed as they can – from local sources. Their diversity is increasing each year, as they find more seed sources (and create their own in newly-restored prairies). Second, they are dealing with first-year weeds by applying Plateau herbicide in the first spring. That herbicide application helps suppress Canada thistle, along with some annual weeds such as foxtail. They also do some mowing of annual weeds when they grow so densely that they block sunlight from hitting the ground. Finally, if Canada thistle does appear, they control it by spot spraying, if possible, and broadcast spraying only when absolutely necessary. Both the Plateau herbicide in the spring and the Milestone herbicide for later thistle control are relatively selective herbicides – though grass and wildflower species that are tolerant of one are not necessarily tolerant of the other. As we walked around the sites, it appeared to some of us that the Plateau herbicide might not be necessary, judging by some areas that were not sprayed. The herbicide application appeared to increase the speed with which dominant warm-season grasses established, and knocked out some wildlflower species – both of which run counter to Bryan and Kyle’s objectives. The weed control provided by the herbicide did alter the weed species composition, but it looked like the unsprayed areas were going to establish equally well (maybe better) compared to the sprayed areas – and might actually have better species diversity in the long run. Experimentation over time will provide better answers than our brief observations last week. The Milestone herbicide applications seem to be effective, because the chemical is certainly effective at controlling Canada thistle, and there are quite a number of wildflower species that are tolerant (recover within a year or two) to being sprayed. Broadcast spraying definitely reduces plant diversity, but that’s only used when absolutely necessary, and spot spraying is used much more often. That spot spraying helps maintain diversity by only applying chemical to small areas and the selectivity of the herbicide means that even sprayed areas maintain some plant diversity. In addition to chemical control, Service staff are working on a research project with Dr. Jack Norland of North Dakota State University to see if they can find ways to increasing seed rates of forb species that might compete strongly with Canada thistle without decreasing overall prairie diversity. This study is intriguing because, in contrast to a couple similar projects I’m aware of, they’re targeting a single invasive species and are trying to find forb species with similar life strategies to compete with the invader. They’re only in their second field season, so it’s difficult to say how the project will work out, but I like the way they’re thinking. 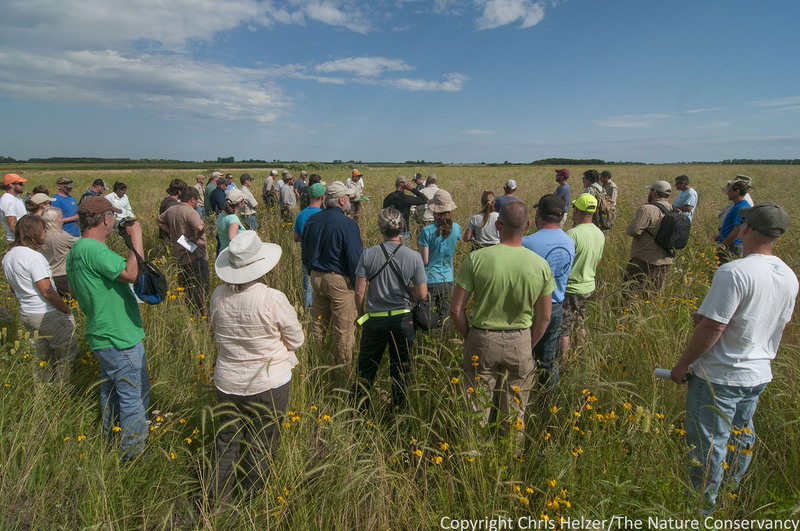 Participants of the Fish and Wildlife Service's prairie restoration conference walk through a second-year restored prairie near Madison, SD. Bryan, Kyle, Tom, and the rest of the Fish and Wildlife Service staff in the Dakotas have a long learning curve ahead of them, but they’re doing great work. Most importantly, they’re jumping in with both feet and building some experiment/demonstration sites that will help address the questions being asked by themselves and others about the potential for high-diversity seedings to work in the Dakotas. Some of their young seedings are already looking great, and it’s hard to imagine standing in one of them and thinking that a seeding of exotic grasses and alfalfa would be superior. On the other hand, success hasn’t been consistent yet (Canada thistle has come in strongly in some seedings) and it’ll be interesting to see how their plant diversity looks over time. They’re getting tremendous growth of warm-season grasses in first and second year seedings, which is nice in some respects, but may make it difficult to obtain and maintain plant diversity in the long term. However, as trips around the country constantly remind me, techniques and results that apply to one site often don’t apply elsewhere, so it’s good to try many different things to see what works best locally. Lots of questions, lots of ideas, and lots of experimentation. Sounds like prairie restoration to me! Why are scientists so bad at using words?